The second edition of Biology: The Essentials epitomizes what the market has come to recognize as Mariëlle Hoefnagels’ distinct and student-friendly writing-style. Mariëlle presents up-to-date information through “What’s the Point?”, “Why We Care”, and “Burning Questions”—pedagogical tools designed to demonstrate to readers, and her own students, that biology is everywhere. 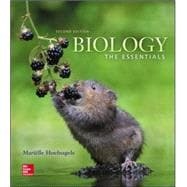 Biology: The Essentials, 2nd Edition offers a broader and more conceptual introduction to biology, simplifying the more complex biological content to the essential elements that students need to act as framework for the details. Mariëlle Hoefnagels is dedicated to helping students find the relevancy of biology and science in their everyday lives. A recipient of the University of Oklahoma General Education Teaching Award and the Longmire Prize (the Teaching Scholars Award from the College of Arts and Sciences), Mariëlle has been engaging, educating, and inspiring students since 1997. She believes that the right tools can make all of the difference in reaching non-majors students. Because of this, the content in this textbook is deeply integrated with the digital tools in Connect and Mariëlle has worked hard to create Connect questions and activities that go beyond simply memorizing vocabulary and facts. Static images are brought to life through animated tutorials, specifically designed to guide students through tough topics. Whether in class or at home, Biology: The Essentials, 2nd Edition with Connect Plus provides all of the resources a student needs to succeed in biology.